The best-selling executive jet in the world. Take your place in the corporate elite with the spacious and elegant Citation XLS+. A memorable aircraft, combining first-rate aesthetics with superior performance, capable of taking you and your business even further. The XLS+ offers everything you would expect from a large aircraft, whether for leisure or business travel. Its range and speed, excellent for the category, make it much easier to travel large distances. In addition, the model can operate on short runways, increasing your destination options. The Citation XLS+ boasts advanced features that make its operation even safer and more reliable. Highlights include the hydraulic brake system and the FADEC system, which provides greater automation and efficiency in engine management, reduces pilot workload, and even makes it possible to save fuel. Aboard the Citation XLS+, any trip is a great trip. The model has the largest cabin in its category, comfortably accommodating up to nine passengers with individual seats, a sofa, and an entertainment system, among other items that make the flight even more enjoyable. 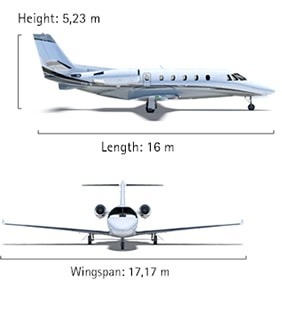 The Citation XLS+ is flawless in terms of aerodynamics. Its design, typical of the Citation line, also provides excellent in-flight performance. The model features a spacious cabin, refined finish, and ergonomic features that provide maximum comfort. 5 Sea Level, ISA, per Part 25.